Master and control section with 8 automated stereo returns. 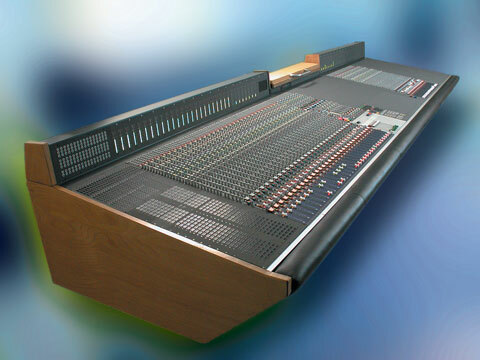 There are no standard frame sizes; as with all modular adt-audio consoles the music production console is custom configured according to your demands. All input modules are fitted with a full featured compressor (with gain reduction meter), expander and noise gate. Compressor-expander and noise gate are independed audio units. The dynamic section and the noise gate can be inserted pre or post the equalizer. In addition the noise gate can be inserted pre or post the compressor. There is a unique 5-band split EQ with 3 fully parametric, overlapping mid bands and 2 shelving bands. The equalizers design is based on the Vienna Robinson's bridge principle and allows a high degree of tonal sculpting. The tonal qualities of this equalizer cannot be described with words. One must hear it to believe. The Console Recovery System CRS stores the positions of all pots and switches separately. Resetting the console is fast and simple. The computer input is through the inserted keyboard. A color monitor and LED chains next to the VCA faders provides visual information about automation activity. A stereo cue send and 9 aux sends are supplemented by an extension system that creates additional sends in the routing. In the inline modules all sends will feed both the tape and record path separately. Using the dual extension system, which provides two additional sends from every channel, allows the operator to split two stereo sends into two separate mono sends. In the inline input modules, every audio chain can be fed separately by each of the sends. In addition, the sends AUX1 to AUX3 can be be fed in parallel from the tape and the record chain. A separate master fader automates the aux sends in dual mono and stereo modules. The master section offers a host of features and a high degree of control. 8 stereo returns with EQ and base width control and elliptical EQ, dynamic processing, MS direction mixer, surround facilities plus a host of other features are added.